The male Starling is a glossy black bird with small white spots across most of it's body, it has a thin sharp yellow bill and a short square tail. 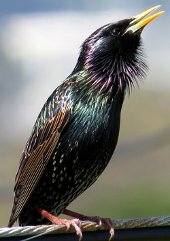 The black feathers of the bird have a green to purple sheen. 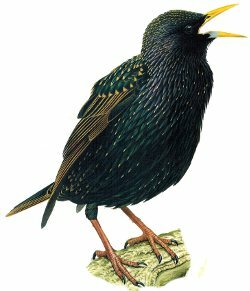 Note: Starlings are well known for mimicry, rarely do two Starlings sound exactly the same. Found right across Europe being resident through central areas and a summer visitor to Northern areas. In the UK Starlings are resident breeders however numbers are dramatically increased in winter by migrants from the North of Europe. 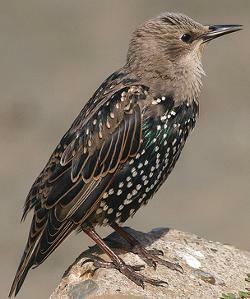 The Starling is considered a red list species due to dwindling numbers in the UK. A bird of farmland, parks, gardens and woodland. In winter the Starling feeds in large flocks on areas of very short grass often near cattle and sheep. A beautiful bird to see close up the Starling looks simply black from a distance. It is one of the only birds to probe the soil with it's bill open looking for it's primary food source which is crane fly larvae also known as leather jackets. Starling nest in holes situated in trees or buildings. Several different shots of Starling, all in winter plumage. The female has more bright buff edging on wing feathers than the male which is blacker. 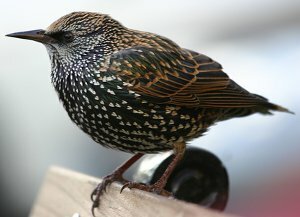 This image shows a Starling in full winter plumage, note the black bill, dull legs and white spotted body with bright buff edging to wing feathers. 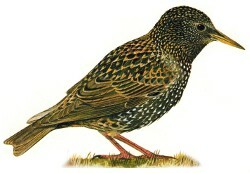 A Starling in full summer plumage, note the glossy black appearance, bright yellow bill and light red-brown legs. This is a male as the bird has blue at the base of the bill. Typically this posture is seen as the bird sings from a high perch or telegraph wire. This charming image illustrates how the young bird starts of as simply a dull all brown and gradually gains it's winter plumage as the season advances, by mid-winter they are difficult to distinguish from adults. 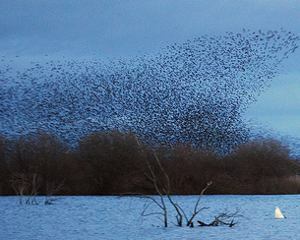 In winter Starlings roost in flocks sometimes numbering thousands, they provide a wonderful spectacle as the move in murmurations across the sky in early evening.